You are here: Home / Tours and Live Performances / 2014 Queenbert Tour / Queen + Adam Lambert Rip It Up on Britain’s X Factor! 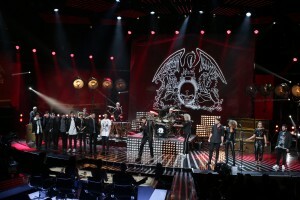 Queen + Adam Lambert performed Sunday on England’s X Factor and gave the contestants a true example of superstar rock. 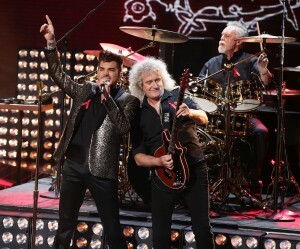 Check out this video of them singing Somebody To Love. As we all know, THIS is how rock is supposed to be done. It’s absolutely amazing that Adam found another way to deliver this song . . . again! This has been another complete circle for Adam. Over 5 years ago, he shared the stage with Queen when he was a contestant on American Idol. Now he’s on stage as part of Queen, welcoming a whole new group of music show contestants! For a full page of pictures, check here. Need I say it? He looked terrific. He should be the biggest star in the world. This version of Somebody to Love was way too short. A medley would have better demonstrated Adam’s amazing talent to the world, but we’ll take what we can get. Thanks for posting!! Fantastic performance!!! I hope they do some US dates again! Amazing. He needs to find someone to write him big songs like this. I know we all say the same thing but I wanted to share something. After my 5th or 6th time watching the video, my husband heard it so he came to stand behind me and watch. When it was over, I said “Yummy?’ He said, “Still gives me chills all over!’ I thought that was so sweet. Seeing so many men who are now devout Adam Lambert fans has been fun to watch. Love the boy and love the man that he has become. And once again I say, he is just so yummy! I wish I could see Simon s face. I believe he knew from the moment Adam first auditioned, he had found a true international star ! I remember on every show, even the ones which he criticized Adam , he always had a smile on his face. Simon, like everyone else knew, this boy could sing !!! !